iStitches Volume Four is now available as an app! Now you have choices, books, apps or both! 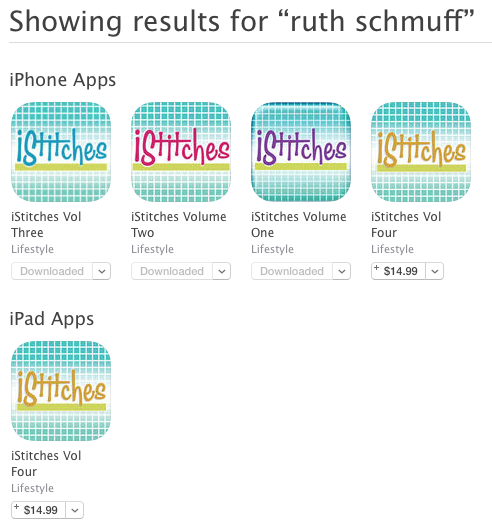 To purchase the app, go to the iTunes store and search for “iStitches” or “Ruth Schmuff” iPhone apps. You can grab Volumes One, Two, Three or Four and carry your stitches with you everywhere. All four volumes use the same interface. Just like the books, you can sort by stitch type or title. You can search. You can zoom in for more detail etc. These are the same stitches that are in the books just even more portable. There are 300 stitches per app! Volumes One, Two and Three are technically iPhone only apps. However they load just fine on the iPad and if you click the 2 x button the images are big and beautiful. With Volume Four, the technology has changed! Volume Four is technically an iPhone and an iPad app. Woo hoo. No need to click the 2x button. It’s all designed into the app. Thank you apple! Thanks Jane! Got it. Very cool. Now I have the whole set. Love having theses apps. So handy! Just perused my copy. There really are great stitches in here! Love it!